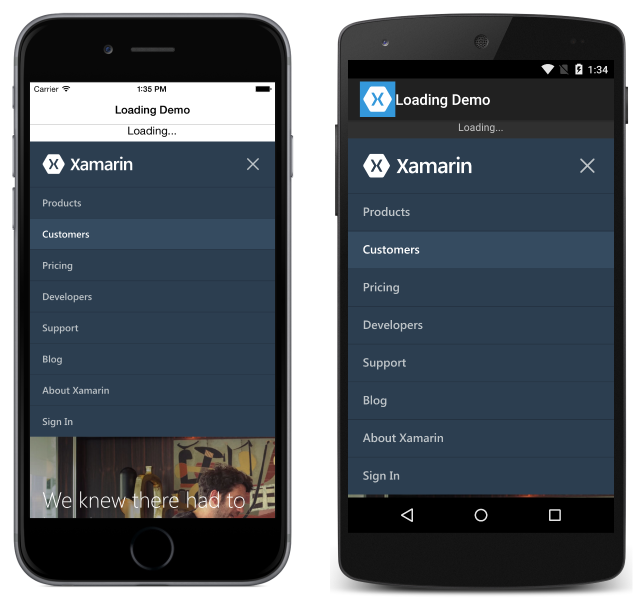 WebView is a view for displaying web and HTML content in your app. Unlike OpenUri, which takes the user to the web browser on the device, WebView displays the HTML content inside your app. Documents – Because WebView is implemented using native components on each platform, WebView is capable of showing documents that are viewable on each platform. That means that PDF files work on iOS and Android. HTML strings – WebView can show HTML strings from memory. 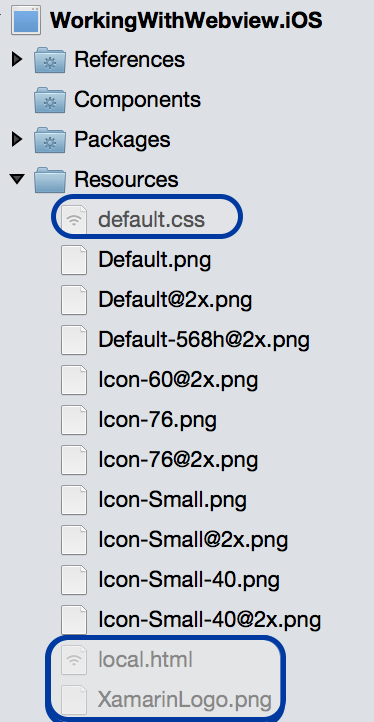 Local Files – WebView can present any of the content types above embedded in the app. WebView on Windows does not support Silverlight, Flash or any ActiveX controls, even if they are supported by Internet Explorer on that platform. URLs must be fully formed with the protocol specified (i.e. it must have "http://" or "https://" prepended to it). Since version 9, iOS will only allow your application to communicate with servers that implement best-practice security by default. Values must be set in Info.plist to enable communication with insecure servers. If your application requires a connection to an insecure website, you should always enter the domain as an exception using NSExceptionDomains instead of turning ATS off completely using NSAllowsArbitraryLoads. NSAllowsArbitraryLoads should only be used in extreme emergency situations. See App Transport Security for more information about this new feature in iOS 9. In the above code, @ is used to mark the HTML as a string literal, meaning all the usual escape characters are ignored. Note that the fonts specified in the above CSS will need to be customized for each platform, as not every platform has the same fonts. To display local content using a WebView, you'll need to open the HTML file like any other, then load the contents as a string into the Html property of an HtmlWebViewSource. For more information on opening files, see Working with Files. To solve this, you need to tell the WebView where to find files on the filesystem. 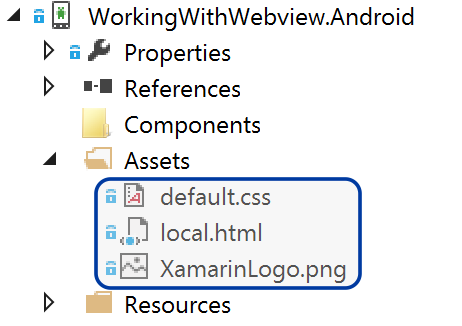 Do that by setting the BaseUrl property on the HtmlWebViewSource used by the WebView. Because the filesystem on each of the operating systems is different, you need to determine that URL on each platform. 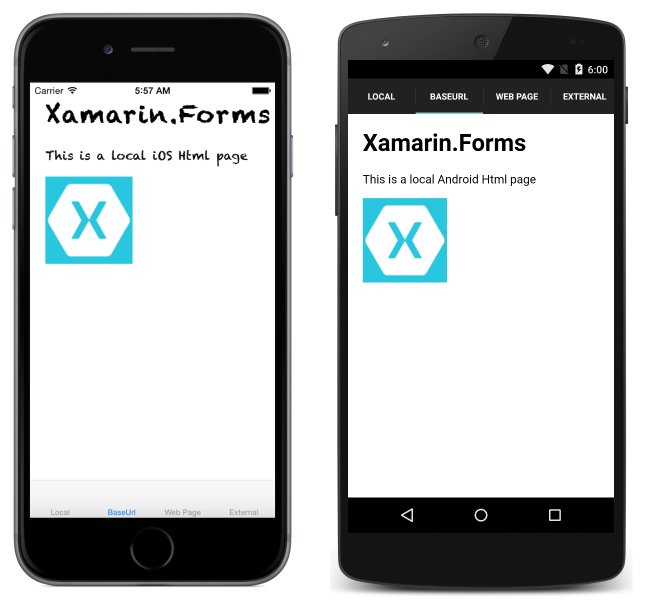 Xamarin.Forms exposes the DependencyService for resolving dependencies at runtime on each platform. Implementations of the interface for each platform must then be provided. 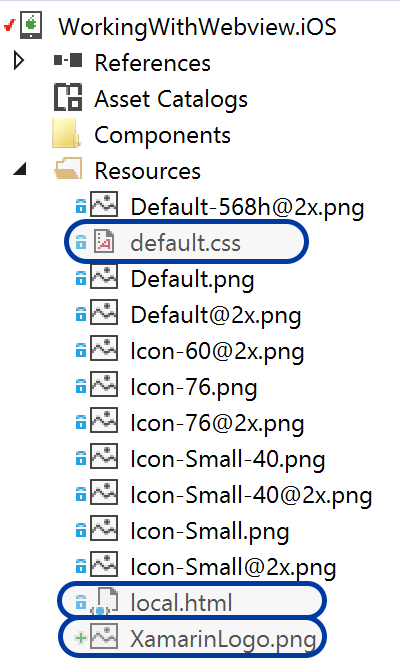 On Universal Windows Platform (UWP) projects, place HTML, CSS and images in the project root with the build action set to Content. GoForward() – if CanGoForward is true, calling GoForward navigates forward to the next visited page. GoBack() – if CanGoBack is true, calling GoBack will navigate to the last visited page. CanGoBack – true if there are pages to navigate back to, false if the browser is at the starting URL. CanGoForward – true if the user has navigated backwards and can move forward to a page that was already visited. Within pages, WebView does not support multi-touch gestures. It is important to make sure that content is mobile-optimized and appears without the need for zooming. It is common for applications to show a link within a WebView, rather than the device's browser. In those situations, it is useful to allow normal navigation, but when the user hits back while they are on the starting link, the app should return to the normal app view. 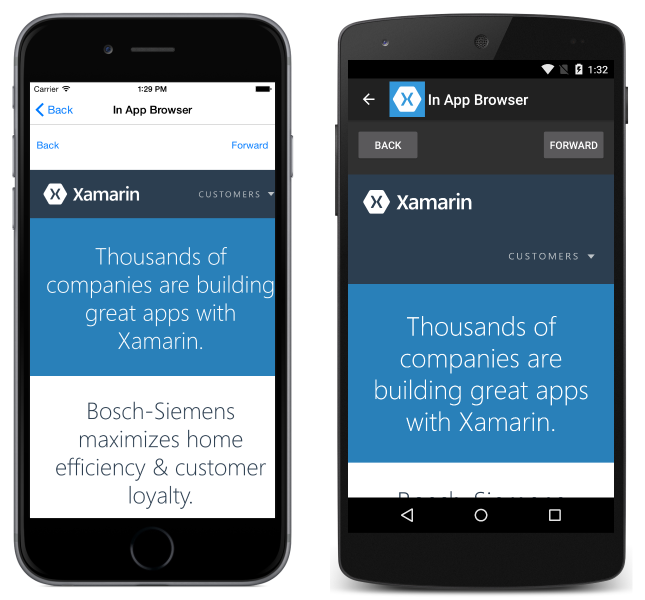 Use the built-in navigation methods and properties to enable this scenario. Navigating – event raised when the WebView begins loading a new page. Navigated – event raised when the page is loaded and navigation has stopped. ReloadRequested – event raised when a request is made to reload the current content. Cancel – indicates whether or not to cancel the navigation. NavigationEvent – the navigation event that was raised. Source – the element that performed the navigation. Url – the navigation destination. Result – describes the result of the navigation, using a WebNavigationResult enumeration member. Valid values are Cancel, Failure, Success, and Timeout. When the Reload method is invoked the ReloadRequested event is fired, indicating that a request has been made to reload the current content. // Opt-in to using WkWebView instead of UIWebView. WebView on Android by default is about as fast as the built-in browser. 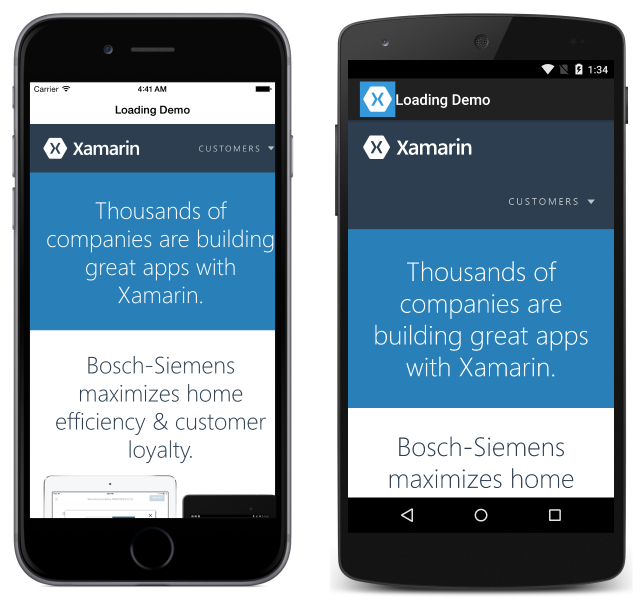 The UWP WebView uses the Microsoft Edge rendering engine. Desktop and tablet devices should see the same performance as using the Edge browser itself. In order for WebView to work, you must make sure that permissions are set for each platform. 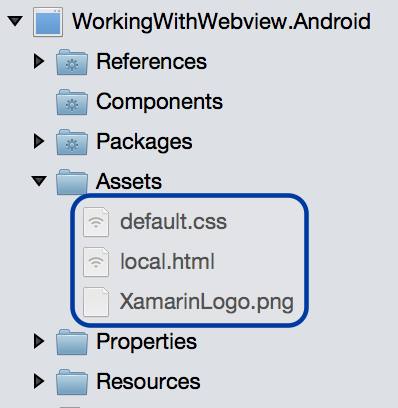 Note that on some platforms, WebView will work in debug mode, but not when built for release. That is because some permissions, like those for internet access on Android, are set by default by Visual Studio for Mac when in debug mode. UWP – requires the Internet (Client & Server) capability when displaying network content. Android – requires INTERNET only when displaying content from the network. Local content requires no special permissions. iOS – requires no special permissions. 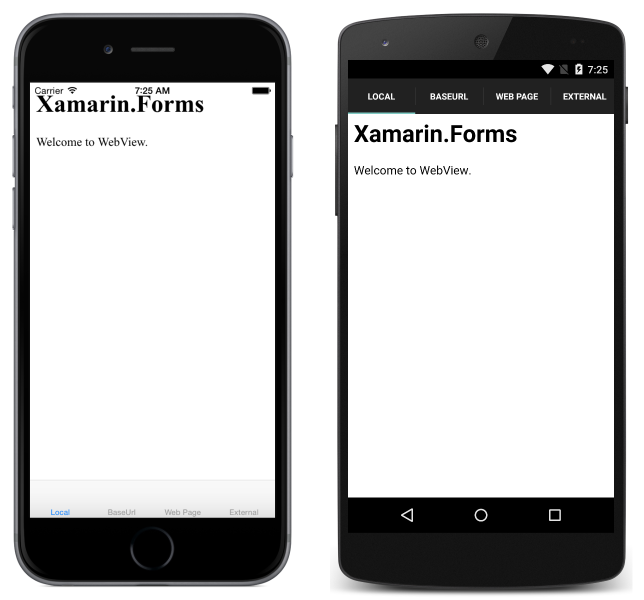 Unlike most other Xamarin.Forms views, WebView requires that HeightRequest and WidthRequest are specified when contained in StackLayout or RelativeLayout. If you fail to specify those properties, the WebView will not render.